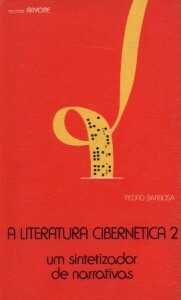 In A Literatura Cibernética 2: Um Sintetizador de Narrativas [Cybernetic Literature 2: A Narrative Synthesizer] (1980), Pedro Barbosa advocates the same analytical perspective of literary machines, which he had begun in the first volume. Influenced by Max Bense and Abraham Moles, the author develops the idea of “artificial text,” which would be later challenged by E. M. de Melo e Castro (1987), in the sense that Castro’s transmedia stance considers that all texts, produced over time with the aid of various technological tools, are always artificial. 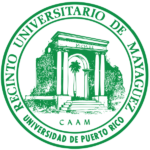 Pedro Barbosa’s pioneering work introduced computer-generated literature (CGL) in Portugal in 1975. Having worked with Abraham A. Moles at the University of Strasbourg, Barbosa published three theoretical-practical volumes of his programming experiences with the FORTRAN and BASIC languages. These volumes deal with combinatorics and randomness, developing algorithms able to ally computing and literary production, bearing in mind a perspective of computational text theory. 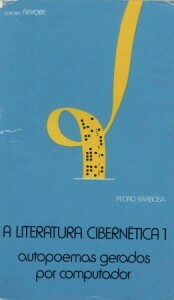 According to the author, A Literatura Cibernética 1: Autopoemas Gerados por Computador [Cybernetic Literature 1: Computer-Generated Autopoems] is an “esboço de uma teoria, toda uma prática, dois métodos e dois programas, que irão facultar a qualquer leitor, interessado e imaginoso, a confecção de poemas automáticos à razão de 5200 versos por hora: no espaço intraorgânico de qualquer computador!” [outline of a theory, an entire practice, two methods and two programs, which will provide any interested and imaginative reader with the possibility of making automatic poems at the rate of 5200 verses per hour: in the intraorganic space of any computer!] 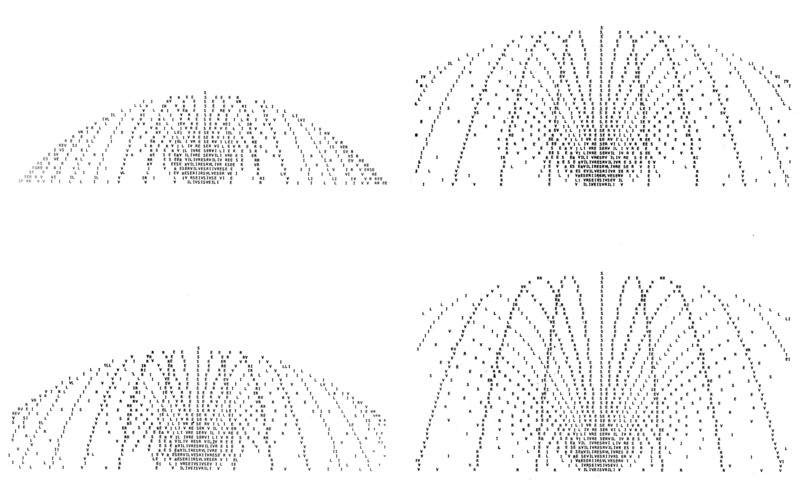 (1977: 8) These “auto-texts,” or “computer-generated autopoems,” hitherto open up a new field of literary theory in the Portuguese context – the direct junction of literature and computation, of writer and programmer. Barbosa’s autopoems were programmed in FORTRAN, ALGOL and NEAT during 1975-76 (Permuta program, Iserve subprogram, and Texal program, Aletor subprogram), using an Elliot/NCR 4130 (a machine introduced in the 1960s in the UK), in collaboration with Azevedo Machado, engineer at the Laboratório de Cálculo Automático [Laboratory of Automatic Calculus] (LACA), at the Faculty of Sciences from the University of Porto. In A Literatura Cibernética 1, Barbosa compiled a selection of textual outcomes generated with his programs: the permutational poems and the random poems. On the one hand, the permutational poems include “Poema de Computador” [Computer Poem], “25 de Novembro” [November 25], “Verão” [Summer], “Silêncios” [Silences], “Cansaço das Palavras” [The Weariness of Words] and the subtitled poems “trovas electrónicas” [electronic ballads], “Porto” and “Aveiro” (8! = 40,320 permutations, 576 verses, running time: 6’ 54’’), exchanging the morphemes “na” (in), “da” (of), “sem” (without), “uma” (a/the) and the lexemes “água” (water), “ria” (estuary/river), “tristeza” (sadness) and “alegria” (happiness). Aveiro, a city famous for its water channels, is portrayed with the opposites “sadness/happiness” and “water/river,” to the extent that the noun “ria,” when a verb, means “laughed,” giving rise to its opposite, “mágoa” (sorrow), through the rhymed interplay with “água” (water). On the other hand, the random poems appropriate, remix and rewrite poems by other poets. Here, one finds the “Transformação” [Transformation] series, with “Camões e As Voltas que o Computador (lhe) Dá” [Camões and the Turns the Computer Gives (It)], which rewrites a Renaissance text (“classic”) with several random transformations of Luís de Camões’s Os Lusíadas [The Lusiads] (1572), and “É Preciso Dizer…” [One Needs to Say…], an appropriation and re-creation of Mário Cesariny’s surrealist poem (“contemporary”) “Exercício Espiritual” [Spiritual Exercise] (1956), in which Barbosa extends the ironic and surrealist practice of the initial lexicon of nouns. What surfaces from the resulting versions of the poems, in addition to the achieved syntactic accuracy and the meticulous encoding work, is a luminous mark of criticism, irony and parody, both to the current state of the official literary canon, and, above all, to the climate of oppression and fear (“medo”) inflicted by the long dictatorship, which was still being felt. Conversely, questioning the perpetuation of a political, social and cultural lie (“mentira”) was the likely path to be renewed by the recent establishment of the Portuguese democracy – history (“história”) as continuity and revolution (“revolução”) in the confrontation between human and machine. The Brazilian poet Erthos Albino de Souza (1932-2000) has a prominent role in the international digital poetry, but unfortunately the records of his work is scarce. Only recently an exhibition was held in his honor: Erthos Albino de Souza. Poetry: the Dactyl to the Digit displayed on the Instituto Moreira Salles, Rio de Janeiro collecting printed poems, letters and journals and other relevant documents, such as the rare copies of the magazine Code (1974 -1990) edited and funded by Erthos.